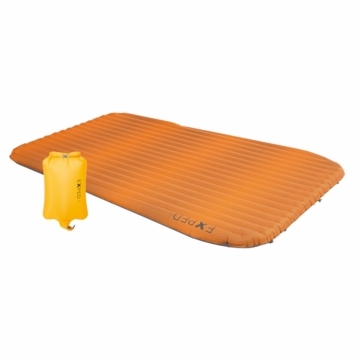 "The worlds lightest, warmest and most comfortable mat in its category is also super compact when stowed! Designed as a mat for two but luxurious as a mat for one. Two separate halves each with separate inflation and deflation valves, individual firmness for each sleeper. This is also an added safety measure in case a leak happens. Next to skin comfort and anti-slip GripSkin honeycomb pattern coating. Laminate is air tight and impervious to hydrolysis. Clever Pumpsack included: The Schnozzel Pumpbag allows you to inflate the mat rapidly while preventing humidity from your breath affecting the insulation. It also doubles as an ultra lightweight compression stuffsack. Insulation: 60 g/m� Texpedloft Microfibre, Bluesign certified"